Services. Otopeni Airport and Baneasa Airport Parking. Park & Fly long term parking services. You are welcome to our long term parking when you travel by plane from the „Henri Coanda” - Otopeni International Airport. For business travels, week-end trips or vacations, Park & Fly aims to make your travel more pleasant, by taking care of your car in your absence. 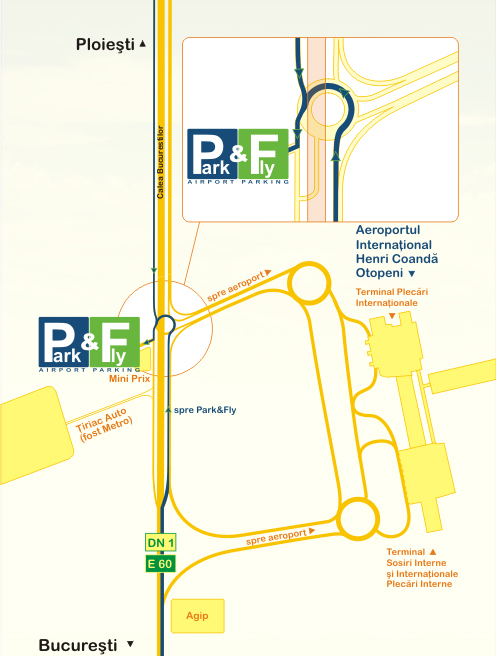 The parking is situated on DN1 road, on the left side on the way from Bucharest to Ploiesti, vis-a-vis from the Otopeni International Airport, in the roundabout under the bridge, next to the Mini Prix shop and Tiriac Auto (please click on the map to see the exact location of the parking). The travel time from the Departures / Arrivals Terminals to our parking lot is only a couple of minutes with our free Park & Fly shuttle. The parking is opened 24 hours a day, 7 days a week and offers guarded parking and video surveillance services. In order to make you a hassle free start to your trip, we offer the possibility to book in advance your parking place, by phone or directly via web. When booking your arrival / departure time from the parking lot, please have in mind the departure / arrival times of your flight and the airline time regulations regarding check-in formalities and the airport mandatory procedures on arrival. When you enter the parking, please obtain the parking ticket by pressing the marked button, placed on the access barrier control device. In case your access ticket was not automatically issued, please call the dispatcher at: 07.300.31.300. Please keep the parking ticket safely (visible on the board of the car), in order to avoid any inconvenience. You can pay for the parking services and leave the parking only on the basis of the parking ticket. Failure to present the ticket when you exit the parking, deterioration or loss thereof, will be charged with a fine of 500 EUR. After parking your car, the luggage will be transferred to the Park & Fly shuttle car, which will make the free transfer to the departure terminal at the airport. At your arrival, after you return from your plane trip, the Park & Fly shttle will pick you from the airport Arrivals Terminal. For any queries or further details on your transfer from the airport to the parking lot, you can contact us at the dispatcher phone number: 07.300.31.300. The fares are displayed on the website in the “Fares” section and at the parking cash-point inside the parking lot. The minimum taxable time-unit is 24 hours and the total rate is calculated based on the total number of units of time. Any started time-unit (time-unit fraction) is considered a taxable time-unit. The fare per taxable unit time varies depending on the length of the stay (decreases with the increse in total duration). Payment of the parking, according to duration of stay, will be made at the parking cash-point. You will get an extra 15 minutes free to transfer your personal luggage in the car and leave the parking lot. Payment of parking can be made in cash only for the moment, but we will soon make available the credit card method of payment.